← Monday Question – What Exotic Destination Would You Love To Escape To Right Now? 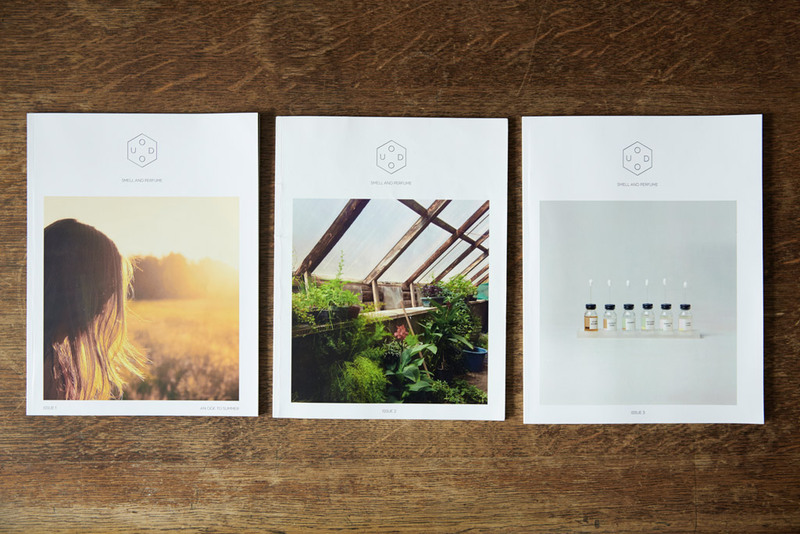 Launched in 2013, ODOU is a bi-annual print magazine that explores smell and perfume through themes of memory, science, art, design, personal reflections, photography and more. There is no other publication that explores the sense of smell alone. ODOU has an international team of contributors and the founder, editor and designer is the wonderful Liam Moore. “Perhaps you’ve been there; the smell of cut grass and the memories of summers gone by, or the whiff of a passerby’s perfume and your head turns. Maybe it’s the smell of your newborn baby’s head or your grandparent’s cooking – nearly all of us have favourite and fond smells. Articles in ODOU discuss all these kinds of topics lightheartedly, longingly, scientifically, even lovingly. Last year the lead article in Issue One, “Perfume Haters” by Neil Chapman (who wrote a fabulous vanilla series here on OT) won ODOU the Literary Award at The Fragrance Foundation’s Jasmine Awards. This year a total of six articles from Issues Two and Three were nominated in various categories and again ODOU took home the prestigious Literary Award. As you can see, the standard of writing is extremely high. All three past issues are still available in digital and print format from the ODOU website. Work on Issue Four is currently underway. It will contain articles on ambergris, fragrance in Greek mythology and a personal account of a perfumer’s journey in education. I love how ODOU explores such a wide range of topics around scent and smell. A crowd funding initiative has been launched via Indiegogo in order to take ODOU to the next level. Backing would enable the magazine to reach more people and stand on its own for future issues. It will also mean that Issue Four can be produced with a look and feel that is befitting of its content. There are some nice perks for funders too, including a discounted copy of Issue Four and a rather cool looking tote bag. Best of luck to Liam and everyone associated with ODOU. It’s a unique project that deserves not just to continue, but to thrive. This entry was posted in By Tara and tagged Crowdfunding, Fragrance, indiegogo, Liam Moore, Magazine, Odou Magazine, Perfume, Perfume Writing, Writing. Bookmark the permalink. Hi Tara. Not really the subject of your post but I just wanted to say that I am a big fan of Alex Musgrave, The Silver Fox, who you quoted above. His piece, Smoky Eyes and Smoky perfumes on CaFleureBon, won the 2015 Fragrance Foundation Award for Editorial Excellence – online fragrance coverage. He also has his own blog, A Scent of Elegance where he writes beautifully about perfume that he loves. I’m also a big fan of Alex’s writing. I had no idea he won that award though That’s great. It’s your writing I love. Portia you are such a sweetheart. ODOU is so well done. I hope the crowdfunding goes well. I’ve made a contribution.